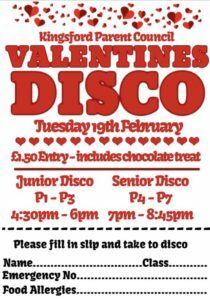 The Kingsford Parent Council Valentines Disco will be held on Tuesday 19th February 2019. Entry £1.50 which includes refreshments and is payable at the door – could all children please bring along the completed form attached to the flyer. All children must be collected by an adult, this is to ensure the safety of the children. Strictly No Parking in the school car park.